Kodak Picture Kiosk GS Compact - PFS / Photo Finishers Supplies Inc. The easy, affordable way to get your share of the growing digital print market. The Picture Kiosk GS Kiosk is a compact unit with most of the features available on standard Kodak GS Compact Kiosks and its low price makes it a perfect entry level unit. The Kodak GS Compact Picture Kiosks can let you deliver KODAK lab quality prints in seconds. If you sell 30-50 prints per day, the GS Compact is the right KODAK Picture Kiosk for you. 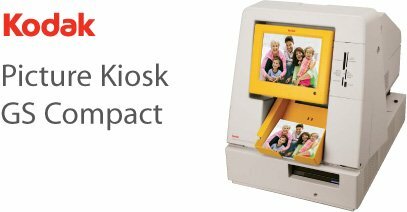 The Kodak GS Compact self service photo kiosk is priced right for smaller to mid-sized retail photo printing opportunities. Our single roll media solution means every available print size can be delivered without changing the media. No additional staff time required when a customer wants something special. Compact design for efficient space and flexible placement. Designed to keep you open for business, the Kodak GS Compact is a reliable and low maintenance solution. Print up to 750 4”x6" prints before you need to refill the printer. The GS Kiosk lets you pick the print size that's best for you all form the same media. Kodak GS Compact Kiosks deliver beautiful and durable prints in just seconds. Exclusive Kodak perfect touch technology ensures better, brighter pictures. Make prints with rich vibrant colors, sharp details and fewer dark shadows. See the difference that consumers really value! The Kodak GS Compact Kiosks offer many options and styles for creating custom calendars in a variety of sizes. For birthdays, graduations or any occasion, the Kodak GS Compact Kiosk enables your customers to create personalized Greeting Cards with their photo and text. They can choose from many different stylish designs to create single-sided cards in portrait and landscape layouts. With the Kodak GS Compact Kiosk, your customers can design and print their own custom invitations, announcements and thank you cards, personalized with their photos and text. The Kodak GS Compact Kiosk offers a broad array of print packages to select from. The customer can create their print package with a single photo, or a combination of a few photos. They can also enlarge photos to 4x5, 5x7 or 6x8.